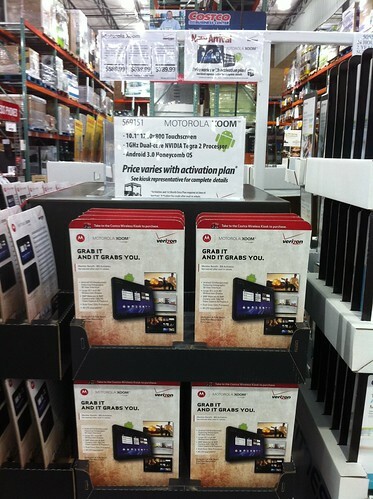 Got to play with one at the Costco wireless booth... Quite nice, much more responsive than I thought it would be. Asked about the WiFi model, they said they probably wouldn't carry it. Need a break from excessive taxes and fees on your wireless bill? Help could be on the way with last week’s introduction of the 'Wireless Tax Fairness Act of 2011' in the U.S. House of Representatives (H.R. 1002) and in the U.S. Senate (S.543). It would provide you with a five-year freeze on any additional or new and discriminatory wireless taxes and fees. Tell your legislators to support this legislation and give you a five-year break on new, discriminatory and excessive wireless taxes and fees. On average, American wireless consumers are already paying more than 16% of their monthly bills in taxes and fees, more than double the average sales tax rate (approximately 7%). The 'Wireless Tax Fairness Act of 2011' would prevent that figure from going even higher - by prohibiting local, state, and federal governments from raising your wireless taxes and fees that are currently on the books, and from imposing unfair new ones. Learn more about the legislation and what you can do to help. Representatives Zoe Lofgren (D-CA) and Trent Franks (R-AZ) are the original co-sponsors of this strongly-supported and bipartisan proposal in the House, and Senators Ron Wyden (D-OR) and Olympia Snowe (R-ME) are the primary bill sponsors in the Senate. Their constituents should thank them for looking out for American consumers’ best interests, and we encourage all others to ask their federal lawmakers in Washington to take a stand on your behalf and support this important legislation. You can tell them do that right now! Government needs to stop placing overspent budget burdens onto the backs of wireless consumers like you, by imposing exorbitant and unfair costs upon them. Let your Representative and your Senators know that you don’t mind paying your fair share, but wireless taxes are going up three times as fast as taxes on other goods and services, and enough is enough! Tell your Representative and Senators you’re tired of being a target for excessive and discriminatory wireless taxes and fees. See where your state stands and take action today in support of the 'Wireless Tax Fairness Act of 2011,' H.R. 1002 and S. 543. These articles were published on March 14, 2011.